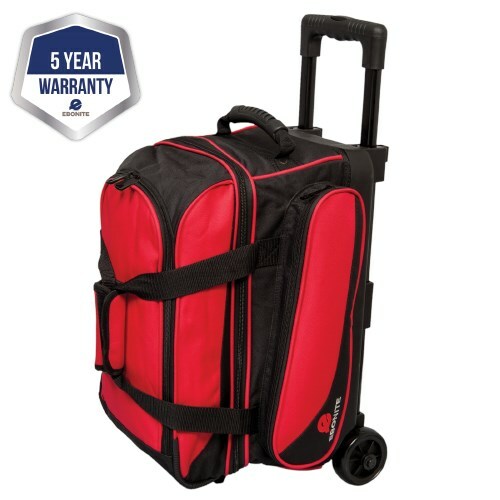 Every Transport II Series wheeled bag has room for 2 bowling balls, accessories, and your shoes. The shoe compartment has built in vents for circulation. The over sized branded zipper pulls make it easy to open and close. Excellent product. Everything fits nicely. My daughter loves her new bowling bag - compact size which holds a lot!! This bag is identical to a lower priced bag of another make that broke in the floor area from handling from an airline baggage crew. The zippers are stronger on the Ebonite and seems the whole bag will give better service in travel to and from tournaments as well as league play. As a gift to my daughter I am able only to say she is very happy to have a new bag. Hello! It looks like the wheels on the Ebonite Transport II bags are about 3.5 inches. Hello Tre. This roller will hold Ten Pin balls. The only information Ebonite gave us for dimensions is Retractable square locking handle extends 37"
Yes, this roller will have durable wheels. Due to the time it takes to produce the Ebonite Transport II Double Roller Red ball it will ship in immediately. We cannot ship this ball outside the United States.